The following oil and gas pipeline projects have been announced. Projects are in order of most recent approximate starting date. All projects are for 2013 unless noted. T.G. Mercer Consulting Services Inc. was awarded a contract by EPOC WEP III to unload and rack approximately 175 miles of 16- and 20-in. pipe in Lea and Guadalupe counties, N.M. Headquarters is Willow Park, Texas. The superintendent is Bruce Munro. Approximate start date: Feb. 1. Snelson Companies Inc. was awarded a contract by Williams Ohio Midstream to install 1,300 ft of 26-in. pipeline and one 16-in. launcher in Monroe County, Ohio. Headquarters is Moundsville, W.Va. The superintendent is Trevor Thayer. Approximate start date: Jan. 28. Right-of-Way Clearing & Maintenance Inc. was awarded a contract by Michels Corp. to clear approximately 5.8 miles of 12-in. and 16-in. pipeline right-of-way in Ritchie and Doddridge counties, W.Va. Headquarters is unknown. The superintendent is Neil Kinneer. Approximate start date: late January (announced Jan. 28). R.L. Coolsaet Construction Co. was awarded a contract by Marathon Petroleum Co. for 15 anomaly repairs on 20-in. pipeline in Marion, Clay and Crawford counties, Illinois. Headquarters is unknown. The superintendent is Joe Elliott. Approximate start date: Jan. 25. Foltz Welding, LTD, dba Continental Pipeline Services was awarded a contract by Shell to take up and relay 1,400 ft of 40-in. pipeline and install 1,300 ft of 24-in. pipeline in Marshall County, Miss. Headquarters is Byhalia, Miss. The superintendent is Scott Schoonover. Approximate start date: Jan. 21. InterCon Construction Inc. was awarded a contract by J Wood Contracting LLC to install approximately 8,800 ft of 20-in. and 4,400 ft of 12-in. pipeline via directional drilling in Belmont County, Ohio. Headquarters is on the jobsite. The superintendents are Dan Greiman and John Jones. Approximate start date: Jan. 21. Northern Clearing Inc. was awarded a contract by Michels Corp. to hand cut trees on approximately 21 miles of 30-in. pipeline right-of-way in Bradford, Wayne and Pike counties, Pa. Headquarter is unknown. The superintendent is Mitch Putnam. Approximate start date: Jan. 21. Phillips & Jordan Inc. was awarded a contract by Welded Construction LP for clearing and grubbing on approximately 5.42 miles of 16-in. pipeline right-of-way in Harrison County, Ohio. Headquarters is Cadiz, Ohio. The superintendent is Mark Smith. Approximate start date: Jan. 21. Precision Pipeline LLC was awarded a contract by Talisman Energy to install 6.5 miles of 16-in. pipeline and 5 miles of 20-in. pipeline in Bradford County, Pa. Headquarters is Rome, Pa. The superintendent is Jake Breunig. Approximate start date: Jan. 21. Welded Construction LP was awarded a contract by Chesapeake Midstream to install 23,093 ft of 16-in. pipeline and 6,359 ft of 6-in. pipeline in Harrison County, Ohio. Headquarters is Cadiz, Ohio. The superintendent is Rob Seebeck. Approximate start date: Jan. 21. T.G. Mercer Consulting Services Inc. was awarded a contract by Enterprise Products to unload and rack 560 miles of 30-in. pipe in Lincoln County, Okla., and Grayson, Kaufman, Navarro, Brazos, Montgomery, Fort Bend, Jefferson and Hardin counties, Texas. Headquarters is unknown. The superintendent is McNeil Mercer. Approximate start date: Jan. 17. Letourneau Products Mfg. Corp. was awarded a contract by Rockford Corp. for clearing, grubbing and matting on approximately 9.8 miles of 16- and 20-in. pipeline in Bradford County, Pa. Headquarters is Wysox, Pa. The superintendent is Mark A. Letourneau. Approximate start date: Jan. 16. Dun Transportation & Stringing Inc. was awarded a contract by Enbridge/Evraz to offload and stockpile approximately 65 miles of 36-in. pipe in Randolph and Salisbury counties, Mo. Headquarters is the pipe yard. The superintendent is Greg Norman. Approximate start date: Jan. 15.
lndianhead Pipeline Services LLC was awarded a contract by Troy Construction to provide foam breakers and pillows for approximately 354 miles of 20-in. pipeline in Baylor, Archer, Young, Jack, Wise, Parker, Johnson, Hill, McLennan, Falls, Robertson, Brazos, Grimes and Montgomery counties, Texas. Headquarters are Archer City and Cleburne, Texas. The superintendent is Mike McGill. Approximate start date: late January (announced Jan. 14). Rockford Corp. was awarded a contract by Talisman Energy to install approximately 8.15 miles of 16-in. and 1.64 miles of 20-in. pipeline in Bradford County, Pa. Headquarters is Hillsboro, Ore. The superintendent is Kevin Newcomb. Approximate start date: Jan. 14. Rockford Corp. was awarded a contract by Linde to install approximately 1,360 ft of 24-in. pipeline in Washington County, Ore. Headquarters is Hillsboro, Ore. The superintendent is Sammy Thompson. Approximate start date: Jan. 14. Phillips & Jordan Inc. was awarded a contract by Rockford Corp. for clearing and grubbing on approximately 117.71 miles of 20-in. pipeline in Lincoln, Fairfield, Pickaway, Fayette, Greene and Clinton counties, Ohio. Headquarters is Lancaster, Ohio. The superintendent is James “Bucky” Lane. Approximate start date: Jan. 8. 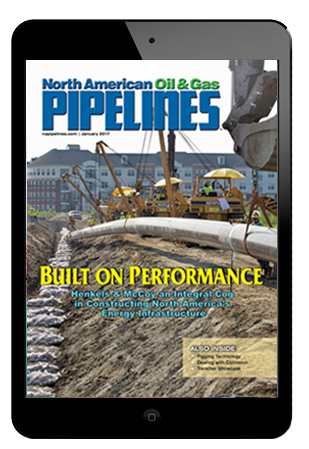 Apex Pipeline Services Inc. was awarded a contract by Mark West to install and test approximately 5 miles of 8-in. steel pipeline in Wetzel County, W.Va. Headquarters is Jacksonburg, W.Va. The superintendent is Robert A. Keaton. Approximate start date: Jan. 7. Associated Pipe Line Contractors Inc. was awarded a contract by Pennant Midstream LLC to install approximately 5.5 miles of 12-in., 3.5 miles of 20-in. and 3.5 miles of 24-in. pipeline in Mahoning County, Ohio. Headquarters is Edinburg, Pa. The superintendent is Kevin Berryman. Approximate start date: Jan. 7. Laney Inc. was awarded contracts by Troy Construction for the following: 1) road boring on 192 miles of 20-in. pipeline in Johnson, Hill, McLennan, Falls, Robertson, Brazos and Grimes counties, Texas. Headquarters is Cleburne, Texas. The superintendent is Randy Cassell. And 2) road boring on 152 miles of 20-in. pipeline in Archer, Jack, Parker and Johnson counties, Texas. Headquarters is Archer City, Texas. The superintendent is Grady Keller. Approximate start dates: 1) Jan. 4 and 2) Jan. 7. Latex Construction Co. was awarded a contract by Atlanta Gas Light to install 21 miles of 24-in. pipeline in Clayton, DeKalb and Fulton counties, Ga. Headquarters is Chamblee, Ga. The superintendent is Bill Burt. Approximate start date: Jan. 7. Snelson Companies Inc. was awarded a contract by Pacific Gas & Electric (PG&E) to provide support crews and general maintenance work in Central and Northern California counties. Headquarters is Ceres, Calif. The superintendent is Jeff Elliott. Approximate start date: Jan. 7. Utility Services Authority LLC was awarded a contract by Diamond K Corp. to install approximately 7,500 ft of 24-in. pipeline via directional drilling in Palm Beach and Martin counties, Fla. Headquarters is unknown. The superintendent is Erv Yoder. Approximate start date: Jan. 7. Harpole Construction Inc. was awarded a 15-mile construction contract by Williams Midstream. The project consists of 15 miles of 8-in. steel. Headquarters is Harpole Construction Yard in Farmington, N.M. The superintendent is John (Jake) Harpole. Approximate start date: Jan. 2. Pe Ben USA Inc. was awarded a contract by Michels Corp. to provide ten stringing trucks and pilot cars to help string 36-in. pipe on the TransCanada Gulf South Pipeline project. Headquarters is Stillwater, Okla. The superintendent is Justin Whitley. Approximate start date: Jan. 2. Harpole Construction Inc. was awarded an approximately 40-mile pipeline construction contract by Western Refining. The project consists of 19.7 miles of 10-in. steel in Lea and Eddy counties, N.M., and 21.4 miles of 12-in. in New Mexico and Reeves counties, Texas. Headquarters is Harpole Construction Yard in Hobbs, N.M. The superintendent is Jerry Harpole. Approximate start date: Dec. 20, 2012. Letourneau Products Mfg. Corp. was awarded a contract by Sheehan Pipe Line Construction Co. for clearing, grubbing and matting on approximately 73.10 miles of 20-in. pipeline in Harrison, Tuscarawas, Coshocton and Muskingum counties, Ohio. Headquarters is Newcomerstown, Ohio. The superintendent is Claude R. St. Pierre. Approximate start date: Dec. 17, 2012. The Napp-Grecco Co. was awarded a contract by PPL Interstate Energy for anomaly digs on an 18-in. pipeline in Delaware County, Pa. Headquarters is Glen Mills, Pa. The superintendent is Randy Betz. Approximate start date: Dec. 17, 2012.